Another wrestling season has come to a close and, for this wrestling mom, the end of her son’s high school wrestling career. I think we can call the 2018-2019 wrestling season a success. I wondered on the drive back from Billings this year how we define that in the sport wrestling. What is a successful year? Is it a coveted state championship for the team or for individual team members? Is it the trophy to hang on the wall or place on a shelf? State placement and a medal around your neck? A winning record for the season? These are the easy answers. Not easy to accomplish, but easy to quantify. Wrestling legend Jordan Burroughs once stated, “Success is the peace of mind knowing that you’ve given your all into achieving a goal.” I have come to define it as even more than that. I believe it is also defined by the character a wrestler demonstrates as he participates in this sport. So, let’s start with the easy stuff. Let’s look the statistics. 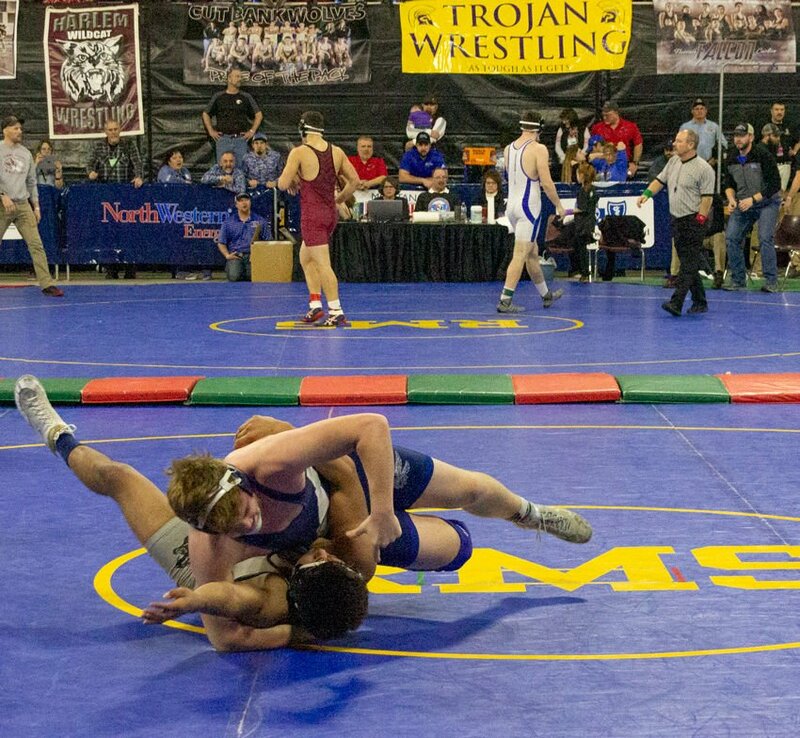 The Montana State Wrestling Tournament brings all classes of schools to the Billings Metra Park for 2 days of wrestling. Competition is divided into 3 different school classes – AA, A and B/C. Each of those divisions has a 16-man bracket in 13 separate weight classes. All totaled, that is 624 wrestlers vying for a place on the podium where the top 6 wrestlers in each weight class are recognized as the best in the state. In the B/C class, 208 wrestlers would compete for those coveted top 6 places in each weight class. Fairfield brought 4 wrestlers to this group of 208 and, ultimately, 3 stood on the podium at the end of the tournament. Let’s look at individual and team results. It is not common for a freshman to make it to the state tournament, let alone place in the top 6, however, that is just what our freshman, Miguel Ramos, managed to do. Miguel won his first two matches by pin before meeting up with sophomore, Krayle Stormer from Circle. Miguel lost that match to Stormer, transitioning him to the consolation bracket. He went on to win his remaining matches by pin, placing him 3rd in the 103 lb group. Stormer placed 1st in the tournament at that weight class. Miguel’s performance ranked him 5th in the state, in all classes and all weight groups, for the most pins in the shortest amount of time with 4 pins in a total time of 5 minutes, 14 seconds. What an amazing freshman year for this kid! Probably even less common than a freshman making it to the state tournament, is for a 2nd year wrestler to make it. Thomas Troy defied those odds and represented Fairfield well. He won his first match by a pin before losing to Journey Grimsrud from Huntly Project. Grimsrud went on to wrestle in the championship match and placed 2nd in the tournament. Thomas continued to wrestle with all he had but, unfortunately, was eliminated in the consolation bracket prior to reaching the top 6. Congratulations to this wonderful young man. He has made amazing strides in such a short amount of time! Kolter Bouma made his second trek to State Tournament this year, wrestling in the 205 lb weight class. Kolter had the misfortune of being paired with Spencer Jones from Florence/Carlton for his first match of the day and lost that match by pin, transitioning him to the consolation bracket. Jones went on to win the 205 championship. Kolter continued to wrestle his way back through the consolation bracket, winning his next 3 matches, placing him 6th at the tournament. Congratulations, Kolter! I am excited to see what next year brings for this guy! Ten years of wrestling culminated at this tournament for senior, Dillon Anderson. Dillon started out the state tournament with 2 wins; a pin against Troy Matt from St. Ignatius/Charlo and a win by major decision against Stran Selman from Huntley Project. He then met up with senior, Cody Blaede from Colstrip and lost that match by a 12-7 decision, transitioning him to the consolation bracket. Blaede went on to place 2nd in the tournament, losing to senior Dylan Nieskens from Glasgow. Dillon ultimately placed 5th in the tournament, ending his wrestling career on the podium at the state tournament. Well done, Dillon. We are going to miss you on the mats next year! As I mentioned previously, I have come to have other thoughts on what a successful season means. In Fairfield, we have become familiar with the phrase, “Win with Character” and I think that is an important standard to expect from our athletes, coaches and fans. At the state tournament this year, I saw wrestlers throw their headgear, refuse to shake hands with their opponents and argue disrespectfully with officials. I saw a wrestler get ejected from the tournament for head-butting his opponent after he lost and another taunting his opponent’s coaches after he won. I heard parents cursing at their kids’ opponents and the officials. None of this came from our Eagles. From them, I saw a lot of smiles, a few tears and exceptional behavior. Win or lose, they showed respect for their opponents, coaches and officials. I saw heart-warming support for each other from our wrestlers, managers, coaches and families. I got numerous texts of support from Fairfield supporters and know that many were watching the live streaming of the tournament. Win or lose, our boys showed amazing character and I could not be more proud of every one of them. It was a successful season on many levels. Thanks for allowing us to share it with you!